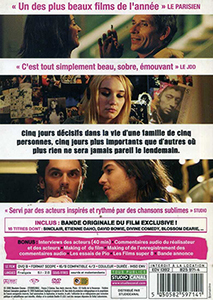 Like other previous movies (Shooting Fish, When Brendan Met Trudy), this French film features ‘In Pursuit Of Happiness’ in its soundtracks. The name of the film is based on a hit single by French singer Etienne Daho. Hence, to promote the DVD release, the music was quite put forward, with a special limited edition of the DVD with a soundtrack CD in a cardsleeve.